I finished the hat on Monday and the blanket on Tuesday (yesterday) and today am in the odd position of not having anything woolly on the go. I did spend ages looking through pattern links I’ve saved, in the notes section on my iphone, and on Ravelry and looked through my favourite makers photos on Instagram, but can’t find anything that grabs me. I think the time has come to stop putting knitting my first pair of socks off. It’s just the thought of all the new stuff to read and try that makes me procrastinate. But I bought all the kit last year and Trish sent me a copy of Christine Perry’s (aka Winwick Mum) sock book. It’s time isn’t it? 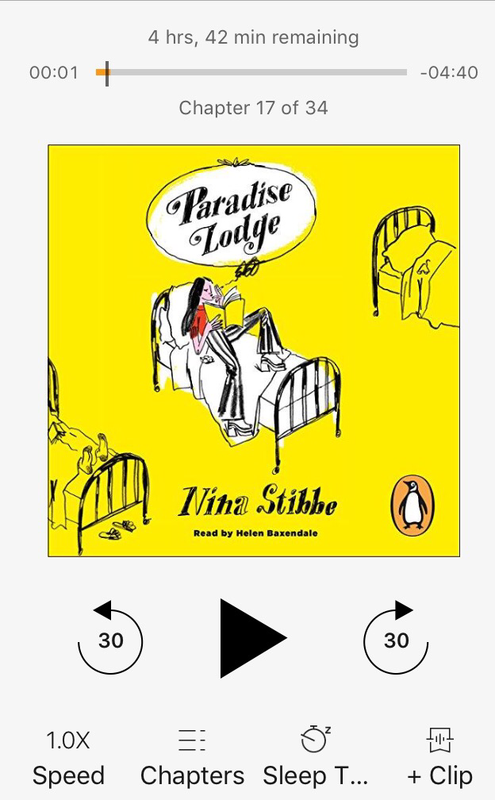 I’m soon to finish If You Go Away by Adele Parks, and plan to listen to the last hour of my neglected comedy audio book Toast on Toast by Steven Toast too. This week it’s all endings isn’t it? Actually there’s more… After several frustrating emails to inlinkz, where we were both typing the same language, but it seemed only one of us actually read what the other had written, it was finally stated (admitted?) that inlinkz is not compatible with WordPress. I was offered a refund. So, we’re back to no proper link up on a Wednesday. However please feel free to add a link to your Yarn Along / Yarning Along post here in the comments and I’ll add it to my post. We can still share what we’re making and reading every week. 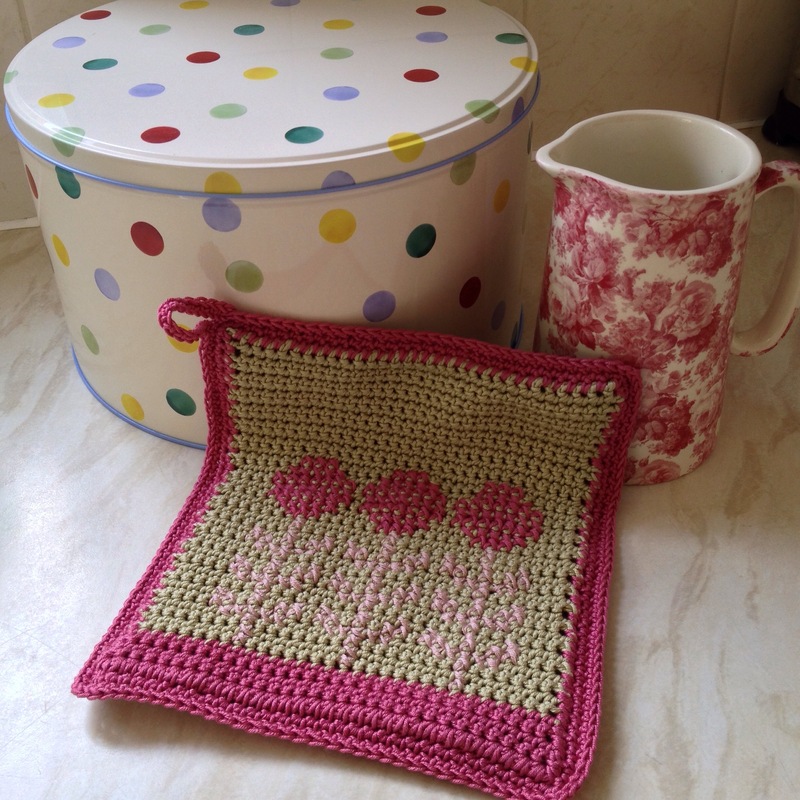 Please feel welcome to share what you’re knitting or crocheting and reading every Wednesday. Leave a current link below to share your photo with us. 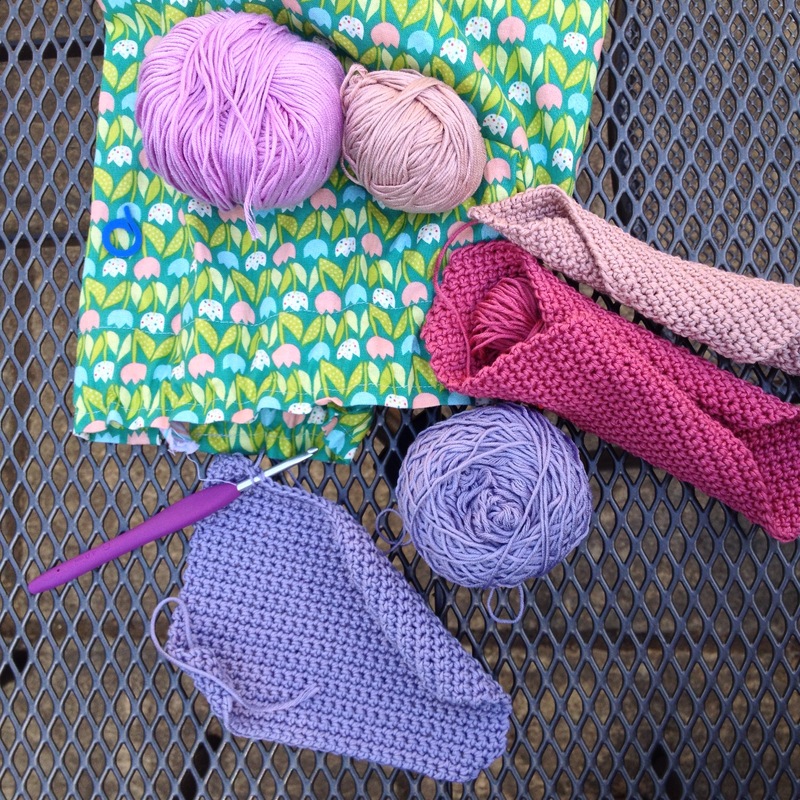 Share your photo on your blog, Twitter, Instagram or on Flickr using #yarningalong. Include a link back to this post on your blog etc so others can find us! It’s the Slouch and Bobble hat mark 2 here! My friend was wearing the first in December, at work in a Special School, and a child grabbed it from her head and threw it over the fence. It’s a bit complicated to explain but although she tried all sorts of ways to retrieve it, including calling the farmer whose field it fell into, she just couldn’t and nor could he. The look on her face was sheepish to say the least, but these things happen. I really don’t mind crocheting another and with something thicker than DK for a change. 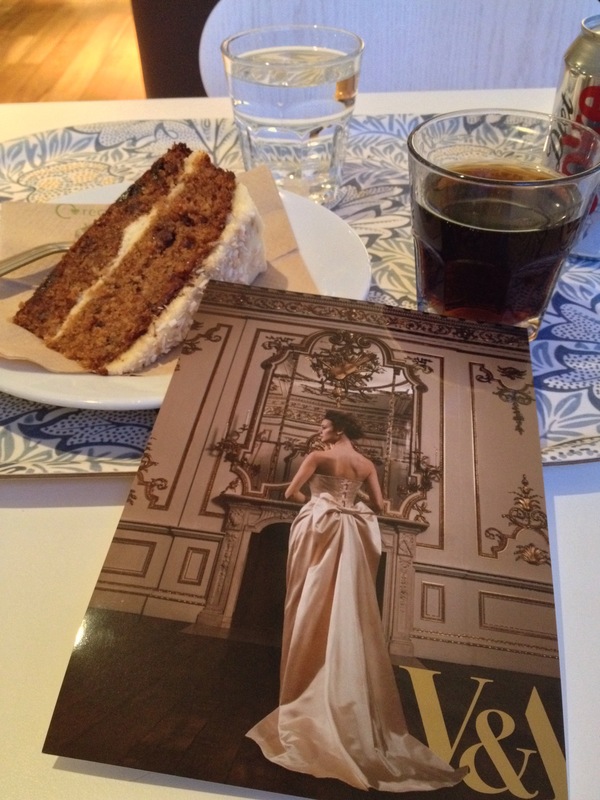 My cousin has lent me The Dressmaker by Rosalie Ham. I’ve seen the film and can recommend it, particularly for the scene with Liam Hemsworth. Just watch that bit if you’re in need of a cheeky smirk! It’s a bit of a kooky film and Kate’s costumes are fabulous! I’m a bit nervous; let’s hope your image thumbnails magically appear here, now I’ve paid for a subscription. 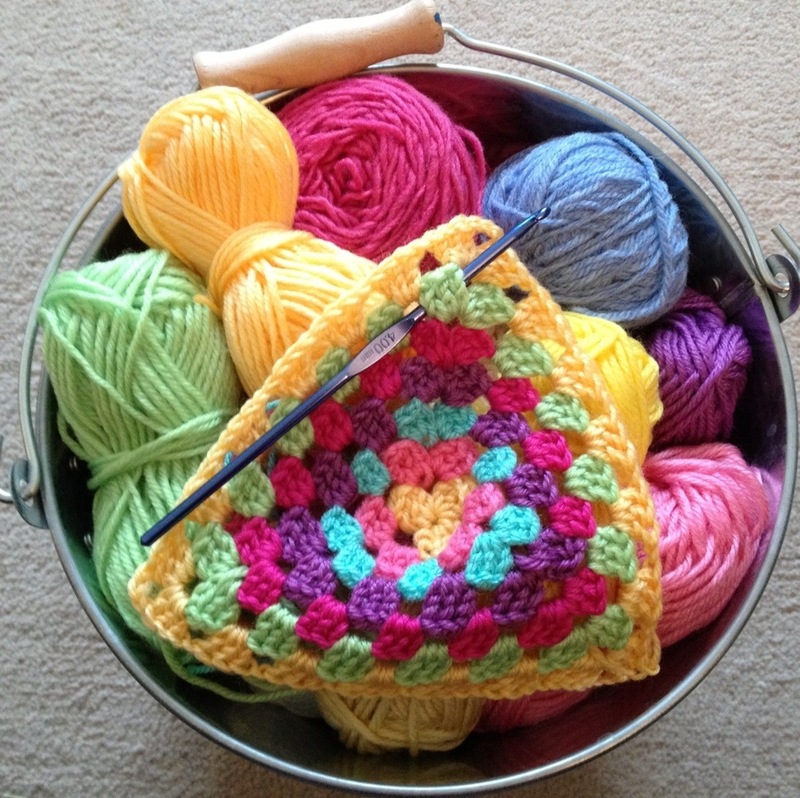 Please tell your followers about Yarning Along on your blog, Facebook, Instagram, Twitter etc! The link up will be up from noon on Wednesdays and open all week. Non-fiction books and craft books can be included, just share what you’re reading. There are no hard and fast rules. I’m not really one for making decorative things for the sake of making them, I prefer to make practical things. Things that look pretty, but will actually serve a purpose are the best. 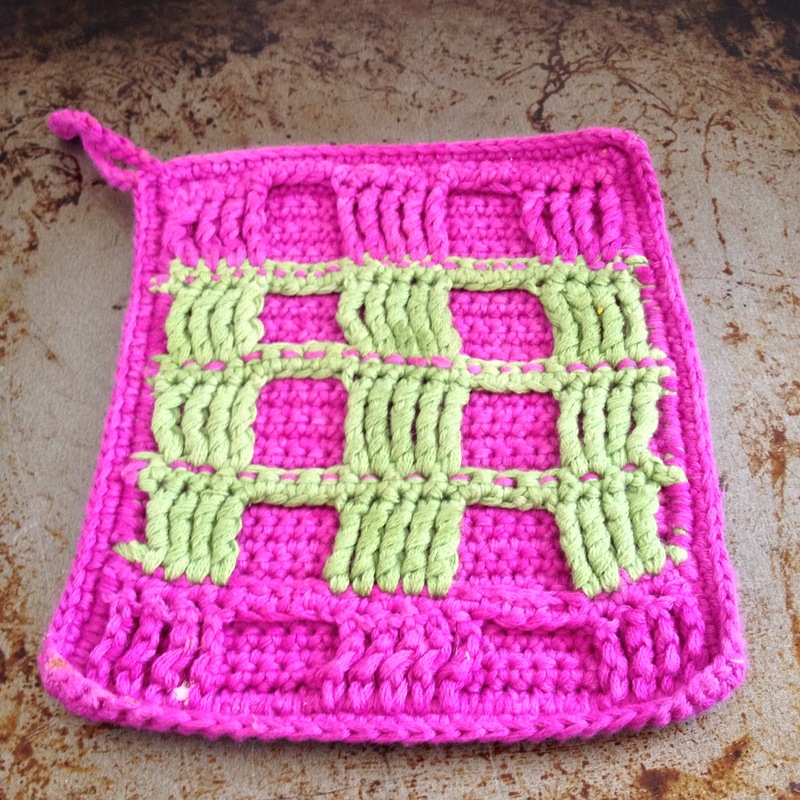 Potholders seem to be my thing, potholders and washcloths. 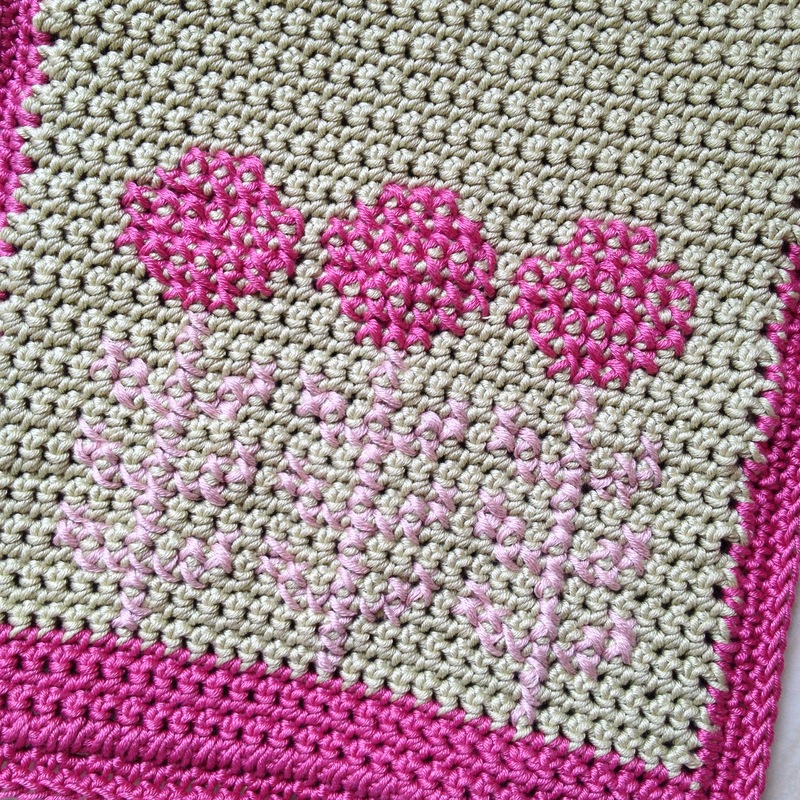 The pattern for the dandelion clock potholder (which looking at the pattern actually has one square in the middle of each flower a lighter shade of pink; so I imagine it’s meant to be a daisy or something. But I thought thistle or dandelion clock for mine as I really think they’re just as nice) is from Kat Goldin’s Hook, Stitch and Give. 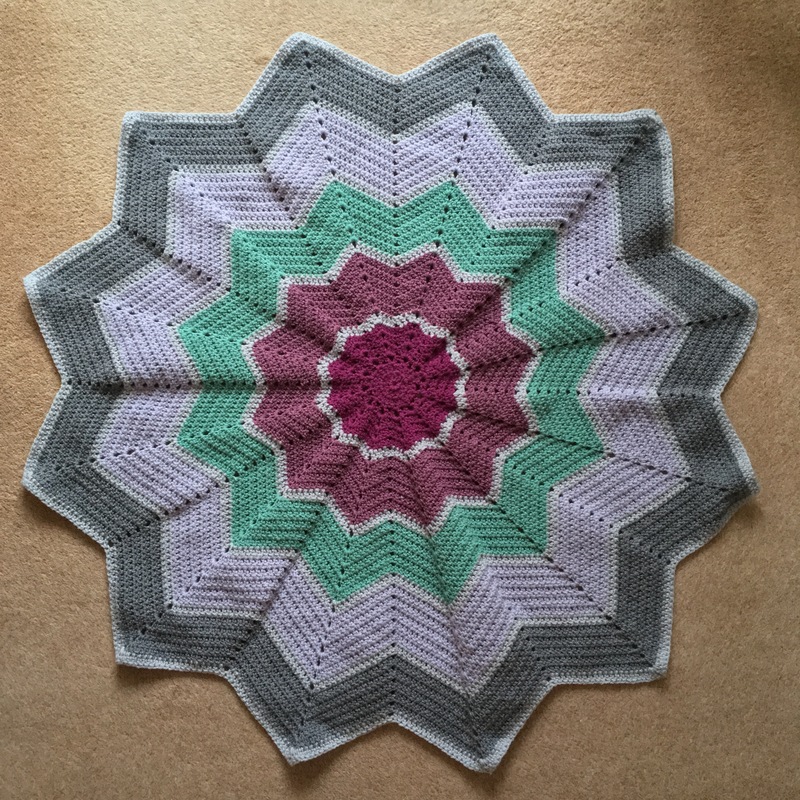 It has been sitting waiting for me to use it again, but I had an embargo on starting any other crochet projects until that blanket was finished! 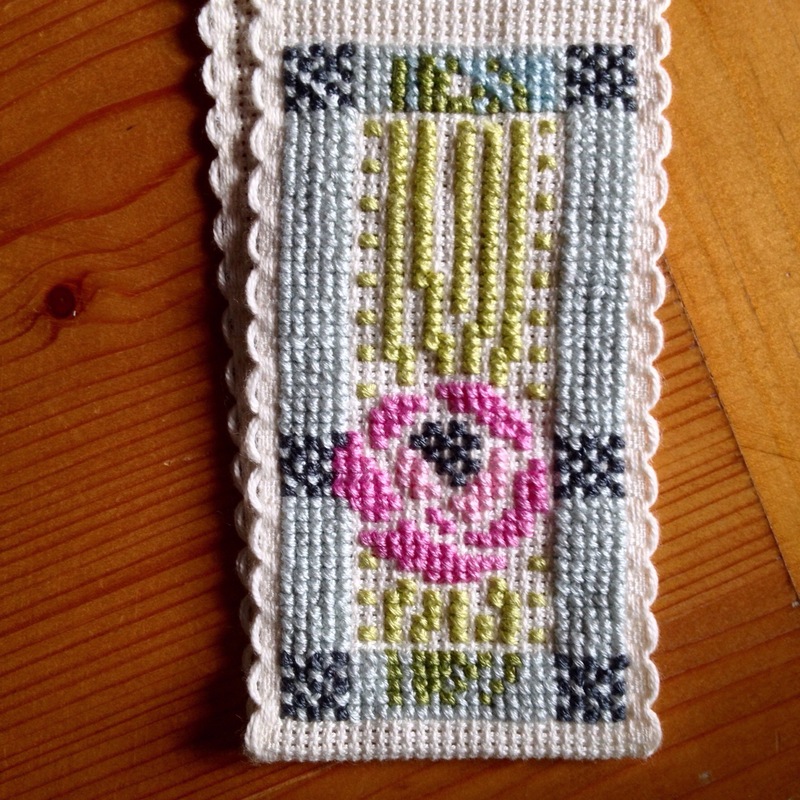 Of course you could just crochet some squares, do some cross stitch decoration, or not, and then DC around the edges through both loops to fix them together. But the book is lovely and I wanted the relaxation of following some well written patterns, and no – I’m not being paid to promote it. Guess what I’m making now? I seem to be in a bit of a cross stitch phase again. 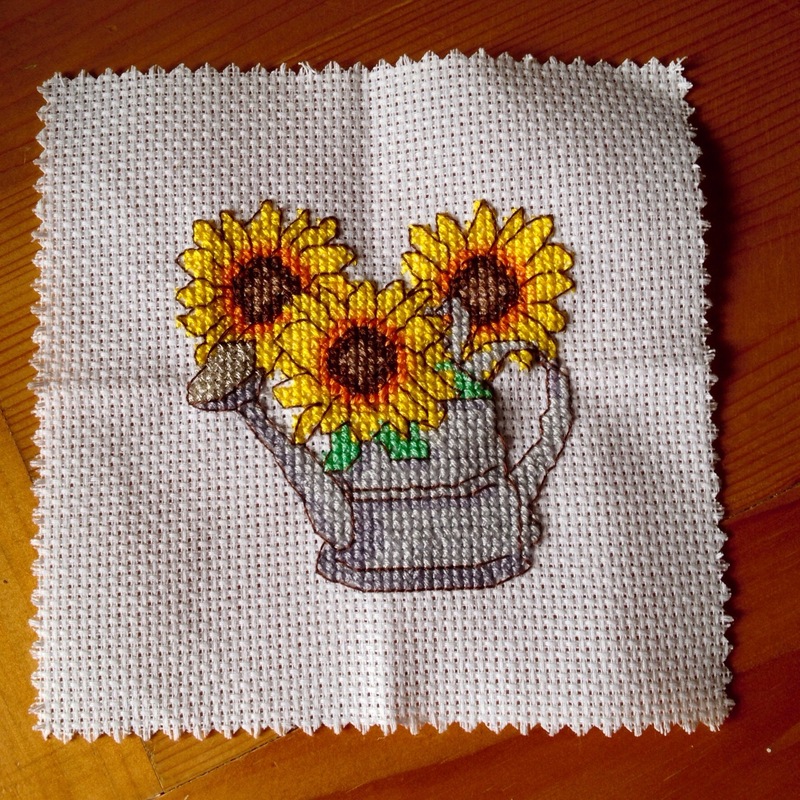 I usually do an annual cross stitch in the summer, just a little one, but it’s continuing at the moment. I have another little kit lined up too. It’s the better light levels, and the fact it’s not a hot, heavy wooly thing during warm weather. 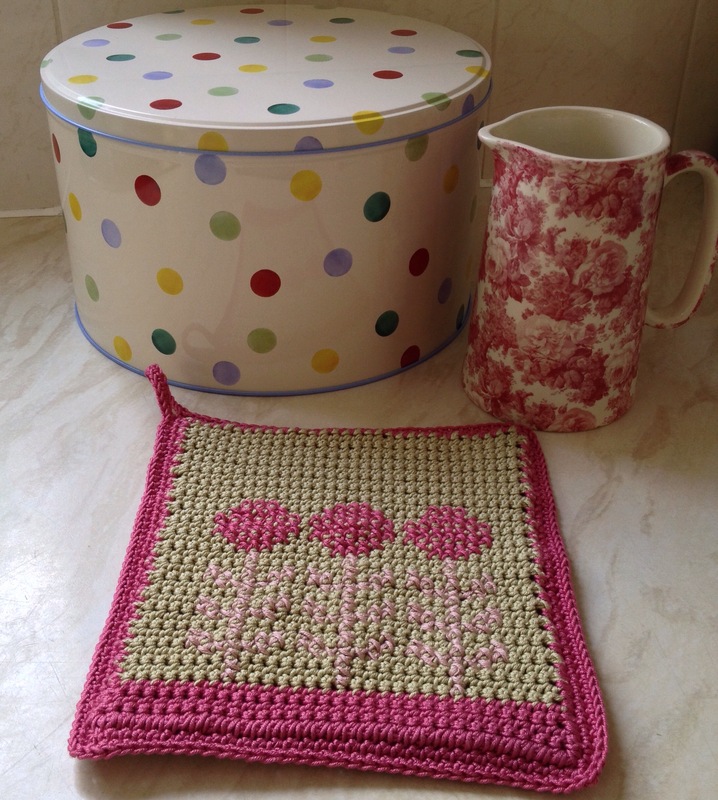 The last is a pot holder in progress, from Hook, Stitch and Crochet by clever clogs Kat Goldin. I watched Bridesmaids (again) and chortled away while I stitched last night. 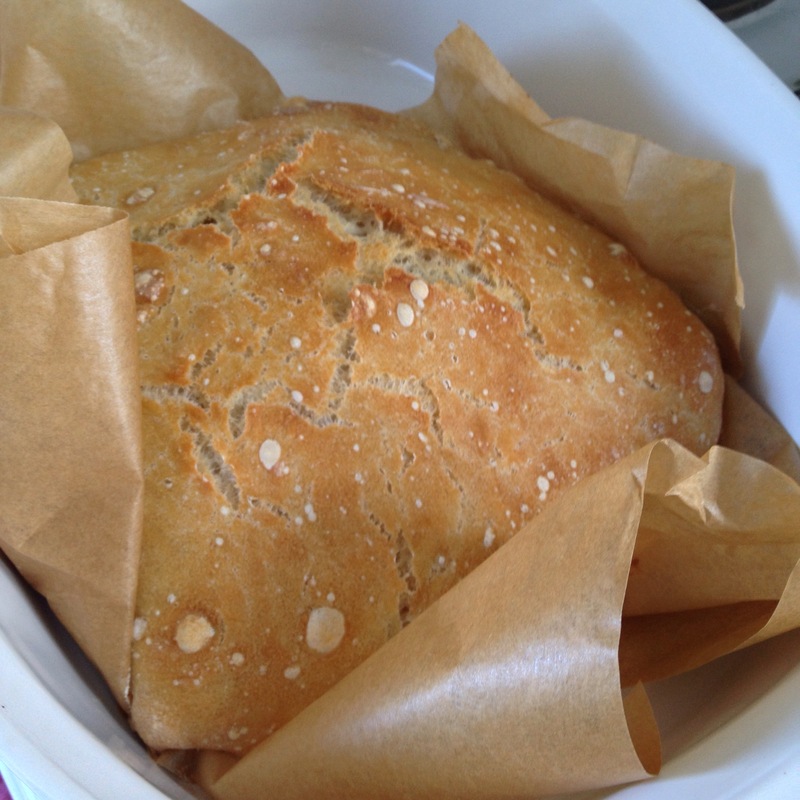 It’s a bit homespun but fun to do. I’ve found out why WordPress seemed to take against Mum’s William Morris curtains so…after nearly four years I’ve finally used up all the free capacity and had to pay to go premium. I quite like having the shorter domain, TheLittleRoomofRachell.com sounds snazzy, but I might sell a blanket or few to go towards the cost. I’m off to rejig that blanket post. I can now add all the photos I wanted to include the first time, before it kept telling me I’d failed. See, no look of an egg cosy here, I thought it would look gorgeous on my friend. The slouchy beanie with pom pom is a success. It’s a Birthday present and definitely lives up to the book’s name: Hook, Stitch and Give. It’s all come out of the marvellous brain of Kat Goldin. No, I’m not being paid to promote. I’m simply a happy reader / maker. 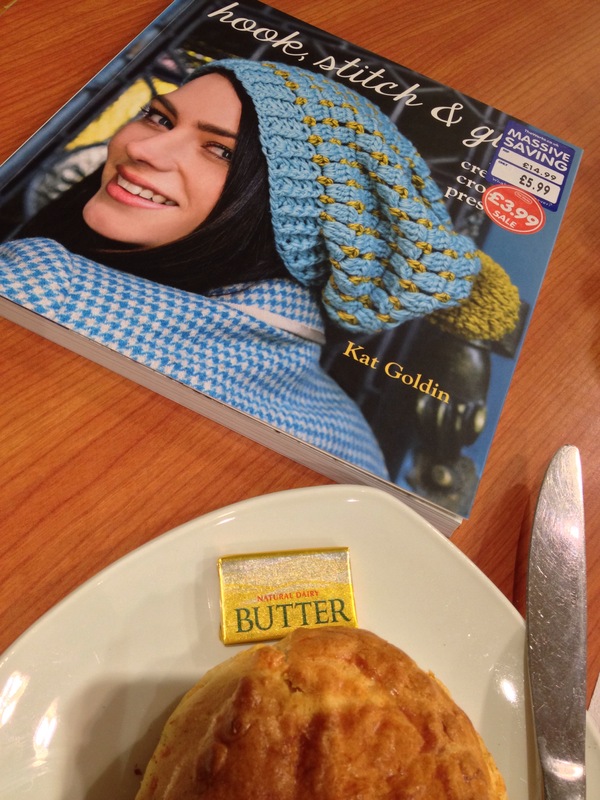 We’ve just had a day out at Excel, London at the Stitching, Sewing & HobbyCraft show. It was too hot during the morning, before the air con was turned on, crowded and overall we felt it was crammed into too small a space. I don’t think the Knitting & Stitch show at Olympia has any serious competition, but we had free tickets, so didn’t feel we lost anything. We probably won’t be going back though. 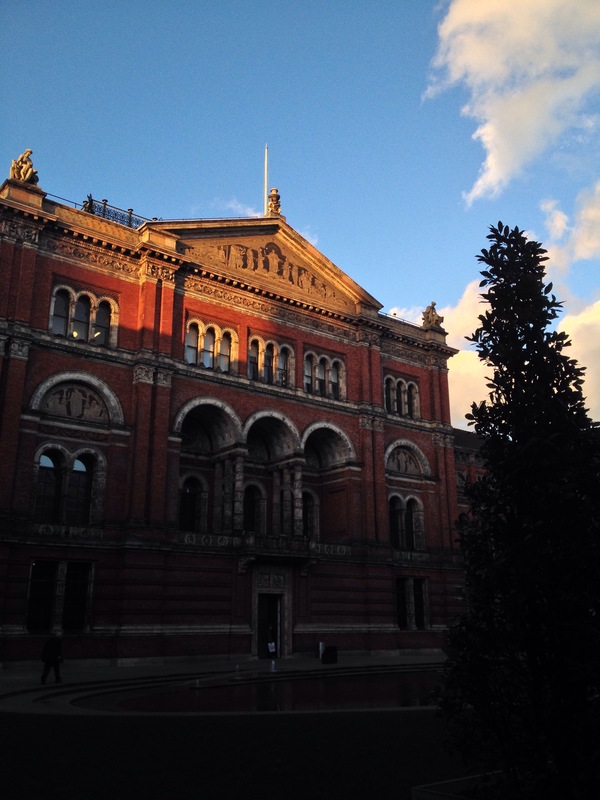 I took a few photos…. Layers of the Anglesey landscape, the colours, lines, details and the ever present skyline inspired this quilt. Liesbeth overlaid sections of strips, highlighted by deliberately messy black stitching. The fabrics were hand-dyed, mono and screen printed, then painted. I love the colours of this quilt – as you can imagine, they look even better with the naked eye than in these photos. It’s also given me hope. Perhaps I could also overlay sections of strips and do ‘deliberately messy stitching’ with my sewing skills, that definitely seems doable! 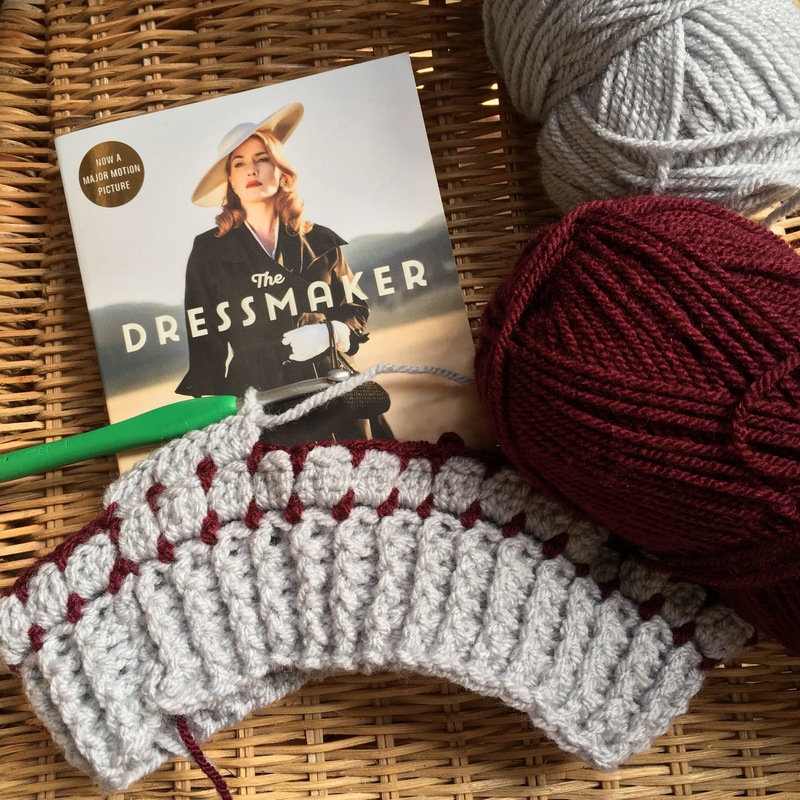 The great thing about crocheting this Kat Goldin pattern, from Hook, Stitch and Give, is that it gave me a chance to practice foundation treble crochet (FTC). I admit I looked around for a few online tutorials just to check I was doing it right. Once I was reassured that I needed to have two loops on my hook after going into the chain, it was plain sailing. Sometimes it’s the basics which I find myself double checking. FTC is basically a way of making a chainless foundation row, you start out with only three chains on the hook but end up with a length of bouncy springy trebles. It’s magic I tell you! FTC is perfect for when you need a stretchy edge. I’m keeping my eyes open for something else which uses this method as it’s cool to try something new. 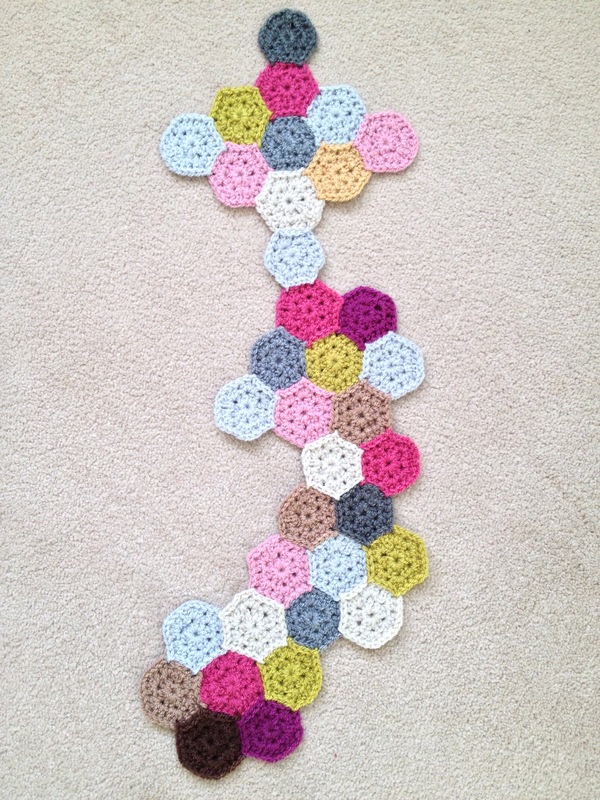 Because I was making this for a friend I wanted to make sure my tension was a-ok; easier said than done I discovered. 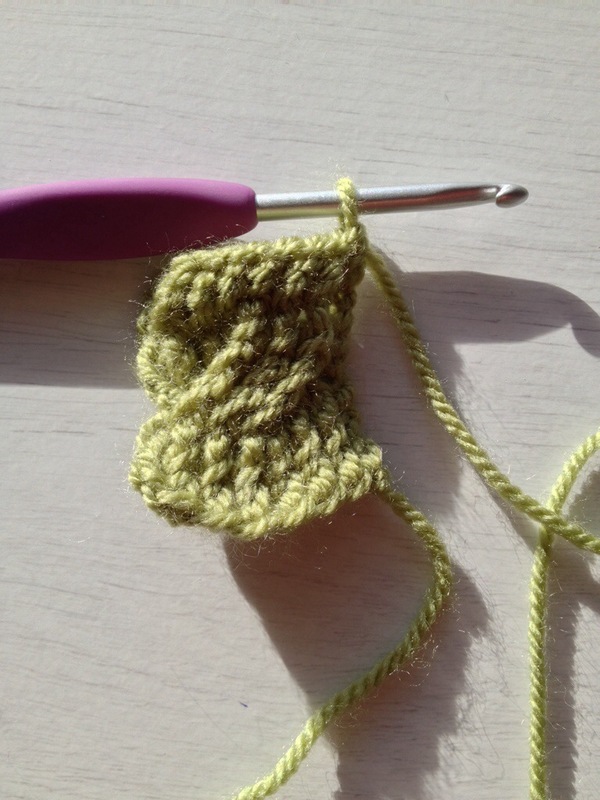 The recommended 5mm hook gave me a swatch of 8cm across and 4 cm high…NOT 10cm square. Ok, so change to a 6mm. 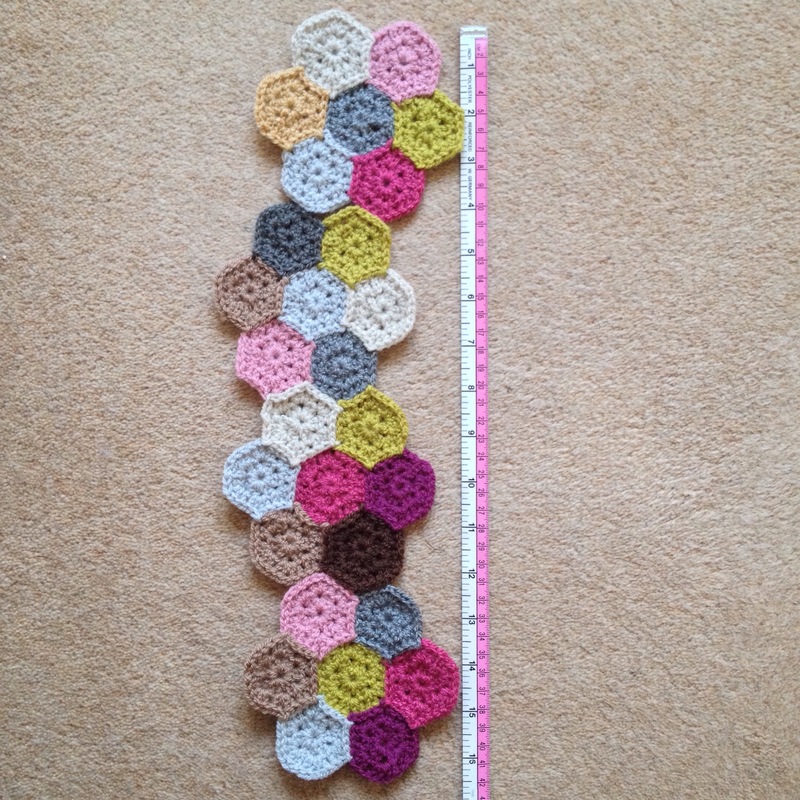 This swatch was close to 10cm across but still only 4cm high. 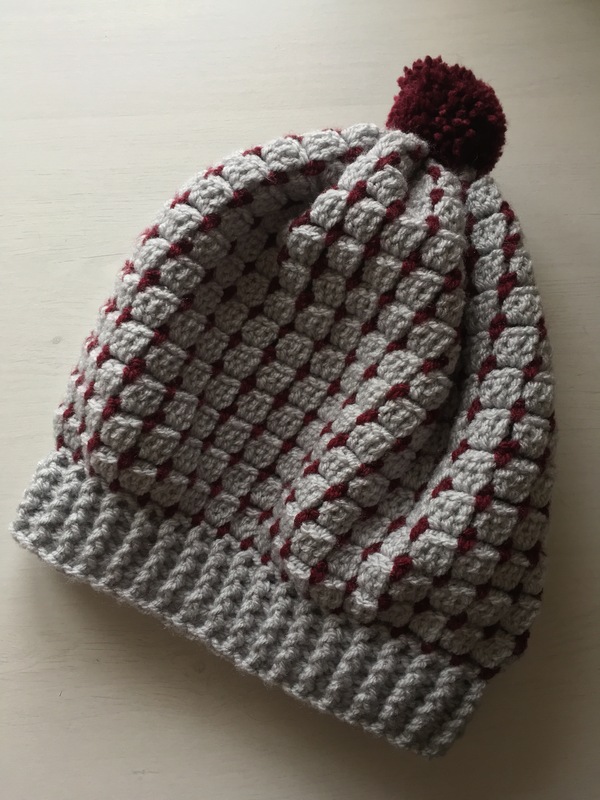 I chatted to one of my hooky IG friends who has made a couple of these beanies and had exactly the same height issue. I’d love to know if you have the same should you make the same, in the interests of curiosity. I’m not sure how you can correct the height thing unless you change to DTR? In the end I decided to use a 5.5mm hook which gave exactly the right circumference for the starting rib for the brim. I decided to wing it height-wise as I had plenty of yarn. I used Stylecraft Life Aran which is a wool blend (25% wool, 75% acrylic) in grey and fern. The wool content and texture of the yarn makes it pleasurable to use, aran weight works up so fast compared to DK. Oh, well would you look at that! I’m tilting again! 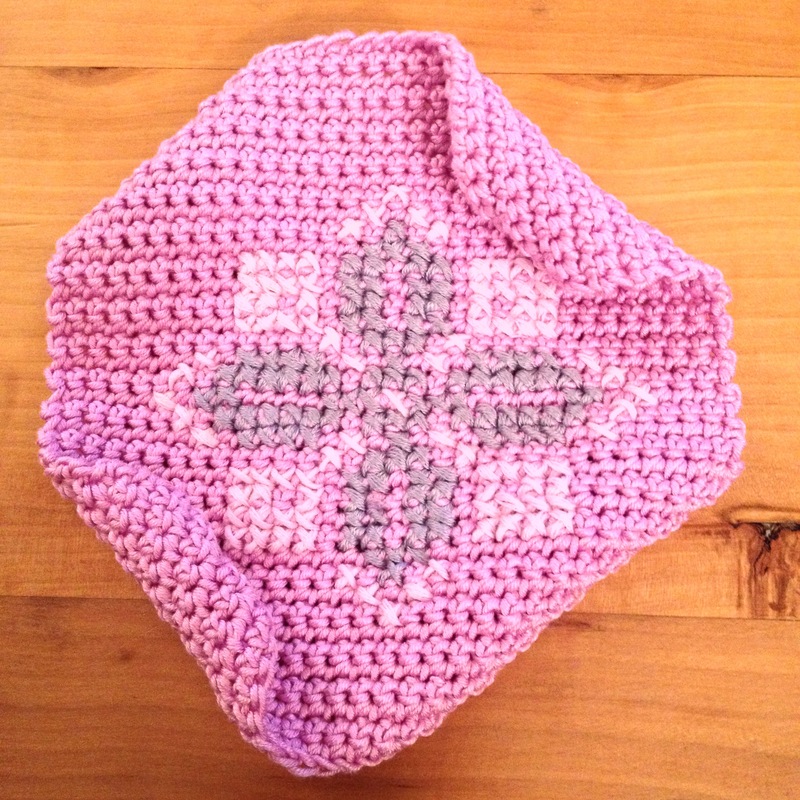 Hannah of Not Your Average Crochet blog said she liked the pattern so much she was using it for a cushion cover, but hers also tilted quite badly. I don’t think it matters at all for a hat, it just amuses me. It happens because you’re crocheting around and around in one direction. (ETA:) I missed out the chain between the trebles; as a hooky friend said they made her hat too slouchy/wide. I tried the pattern as written and found the same, so also missed them out. This looks like pizza doesn’t it? I gave Nigella’s crustless pizza a try at the weekend. The recipe’s from her Kitchen book. It was revolting; basically cheesy Yorkshire pudding. I ate the topping and a bit of crispy edge then the food recycling bin had the rest. Here’s my version of the Slouch and Bobble hat from Kat Goldin’s Hook, Stitch and Give book, sans bobble because I’m getting round to sewing it up. Same old story hey. On me it looks like a tea cosy, but on my friend it will probably look gorgeous! Anyone relate? I laughed aloud (20th C usage alive and kicking) yesterday to see that behind the garden centre/pick your own/farm shop/fishing lakes/carousel there are llamas in a small field, not the sheep (lambs?) I expected to see. Those llamas are getting everywhere these days! Hurray they sell smoked garlic; I’ve only bought it from the Isle of Wight Garlic Farm before. I love it though my fridge stinks for weeks. A few cloves were delicious in a chicken traybake I threw together last night. Like my fridge I also carried the garlic tang today but it was worth it. Five Happy Things type of posts, to be frank, can set my teeth on edge as they are sometimes very syrupy reading, they’re also not the most interesting. Do you remember when the 52 Weeks of Happy blog posts appeared last January? So many gave up writing them by May, if not sooner, because I think people found they were not very interesting to write either. I do enjoy ‘ randoms’ though as they give a bit of snapshot. 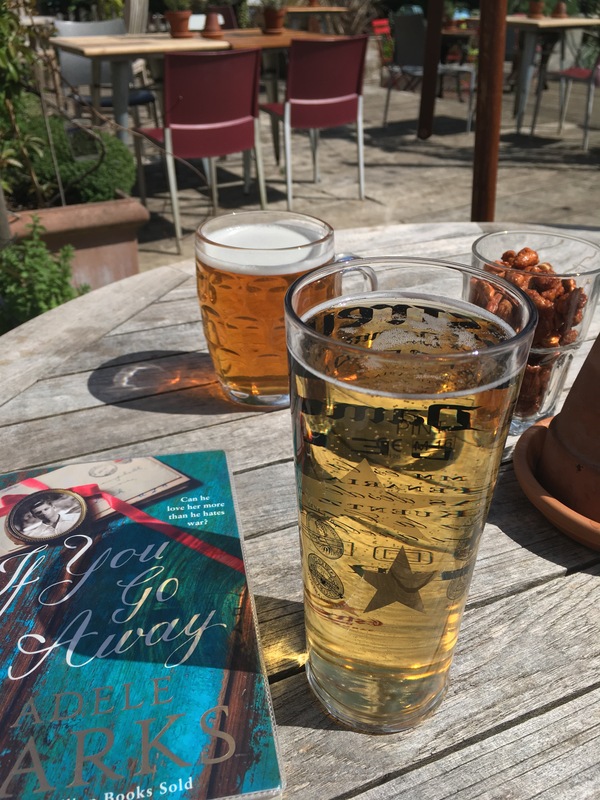 If you fancy posting your own Five Things add a link below please, so then I can read yours. By jove I think she’s got it! Here is a reminder of why this is a big moment! Today was the very, very last time of trying to get this cable crochet yoke for a cardigan right. If it didn’t happen the book was going to be (gently) thrown across the floor, then sold. 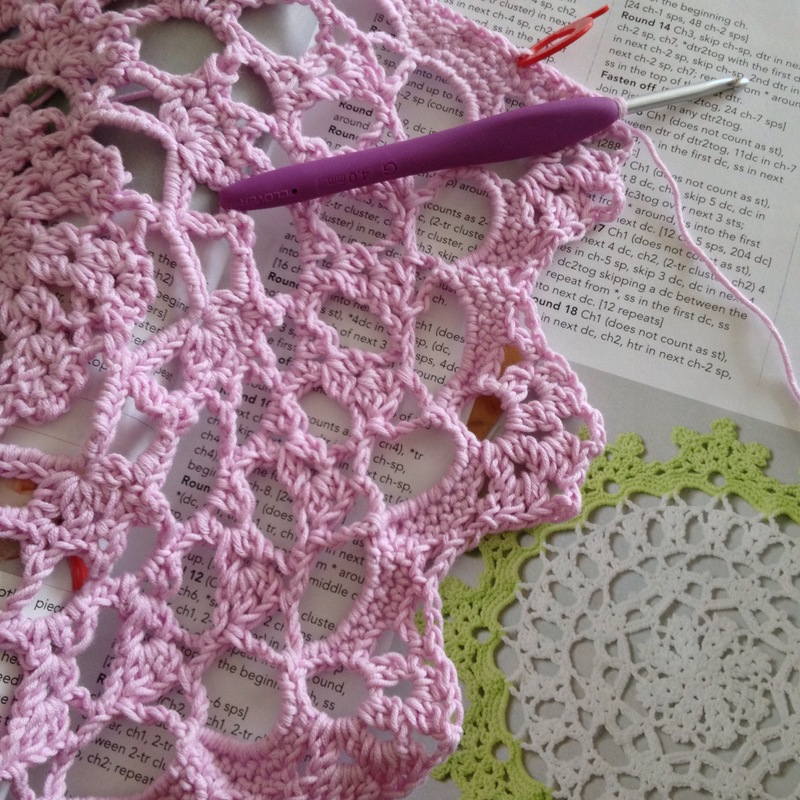 I’ve been meaning to put my post on Left Handed Crochet here for ages. I originally wrote it for Kat Goldin’s Crochet Camp on her Slugs on the Refrigerator blog way back in the Summer but wanted to put a copy here also for any fellow lefties who might be passing. After a quick Google of the percentage of left handed people globally I’ve found that figures vary between 10-15%. This illustrates a fact that I’ve always known – there really aren’t very many of us around. 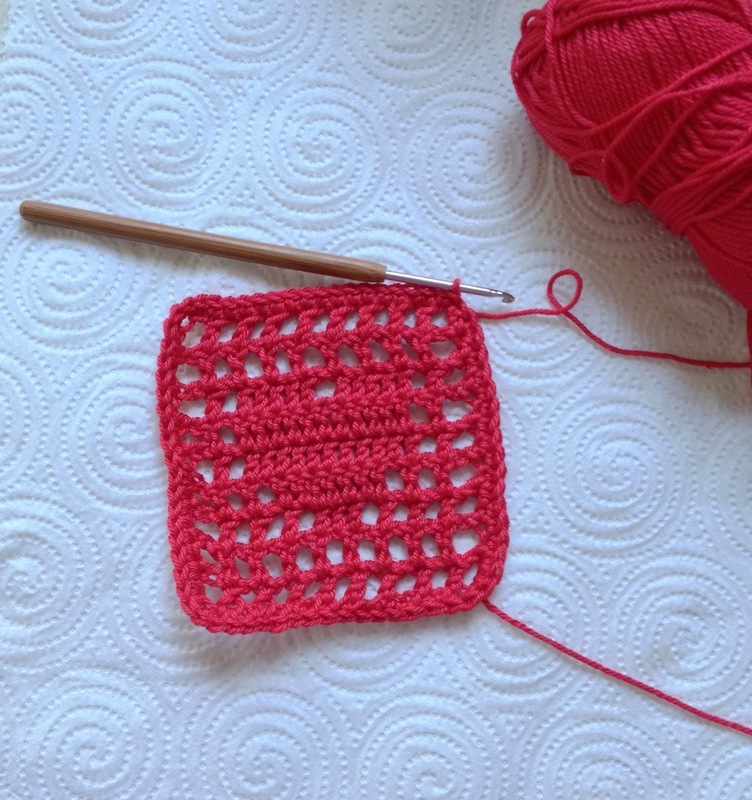 It’s interesting that there seem to be slightly more men than women who are lefties, fewer who crochet though no doubt. I’ve also read statements that say left-handed people produce an above-average quota of high achievers. Bring it on! Alexander the Great, John McEnroe and Billy the Kid are listed as notable lefties in one article, which discusses how left handers are better in a fight because of the element of surprise (!) but perhaps we’d better stick to crochet for now shall we?! 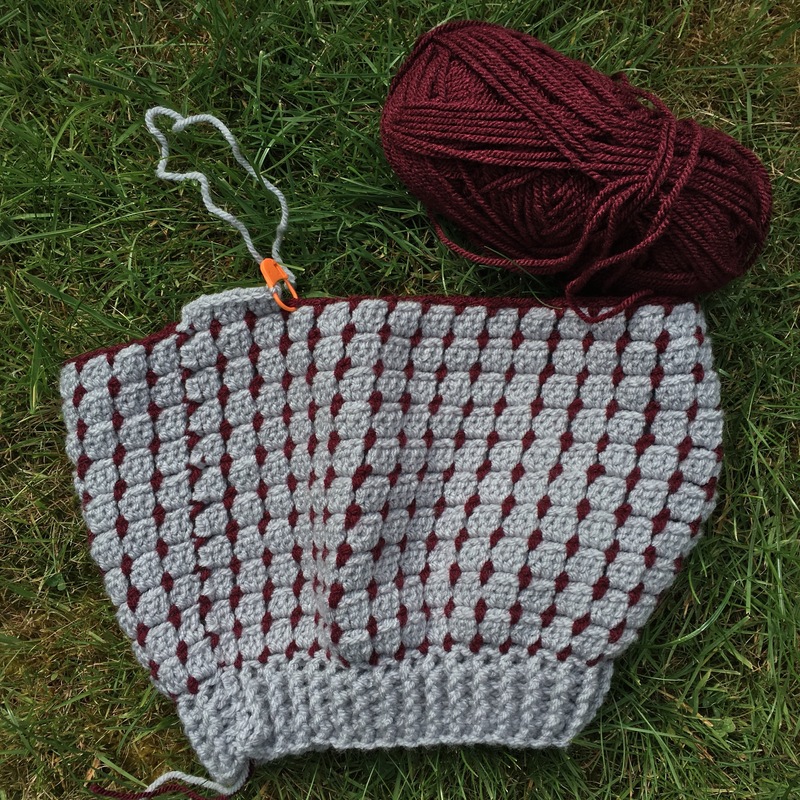 When I’ve crocheted in public I’ve had sometimes comments about looking “cack-handed”, been told it “looks really odd like that” and I’ve also been asked “Don’t you find it hard – doing it like that?” The last one just makes me laugh. Actually I like being different to the majority, although when I was learning to crochet it was a different story as I grappled with instructions and illustrations where the hook was always shown held in the right hand. I tried to squint and imagine it all reversed, but this wasn’t very successful at the beginning. I have heard that you can learn from or teach, a right hander by sitting opposite them and copying their actions as if they are a mirror image. I haven’t tried this approach yet. I need a willing victim to try this experiment. In the end I found a small range of teaching aids. 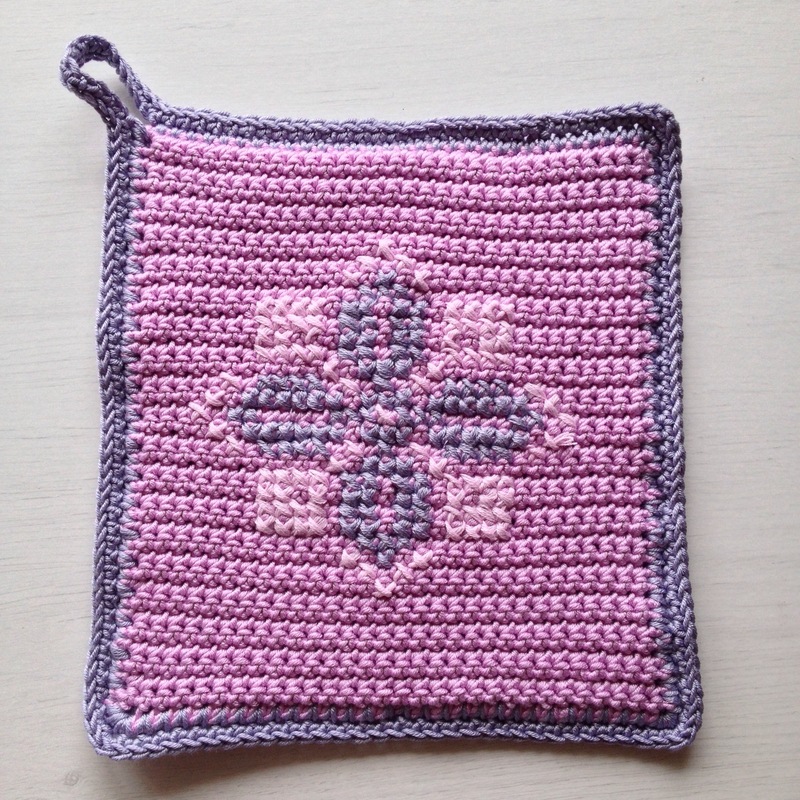 The best one was a smallish booklet I found on Amazon called Crochet Unravelled by Claire Bojczuk, which is for complete beginners and uses illustrations for left and right handers. I can’t tell you how good I found this simple straightforward guide. To be honest I credit Claire Bojczuk with teaching me to crochet. I don’t know her, we’ve never met or corresponded but I think I’d give her a bunch of flowers if we ever did! 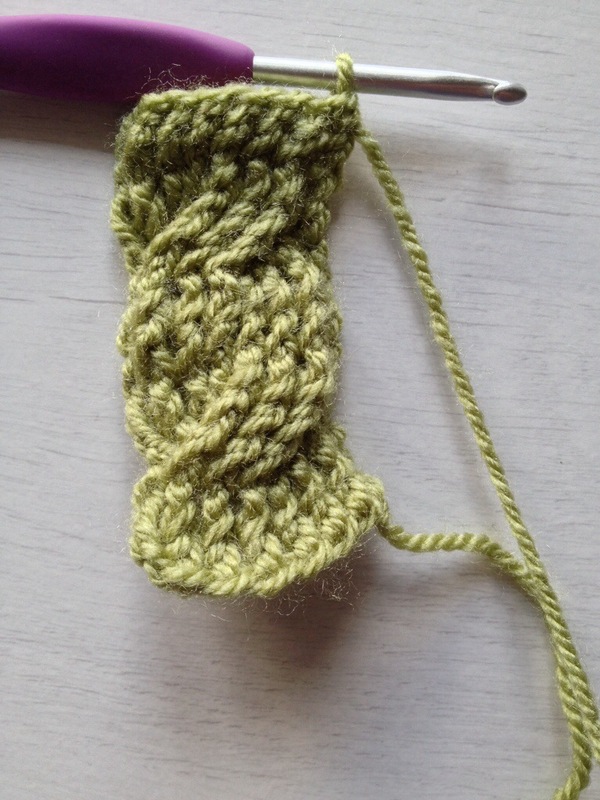 YouTube videos showing left handed demos can be really useful as they’ll show you ways of holding the hook and how to scoop the yarn in a clockwise direction (as opposed to the righties who scoop it up anticlockwise.) When I was learning I watched sometimes, just for the pleasure and encouragement of seeing another leftie. 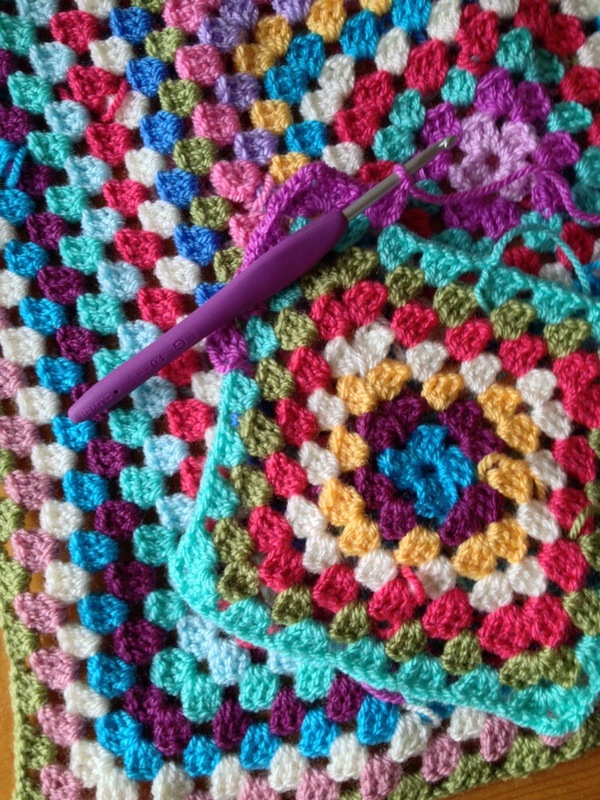 I don’t know any other left handed crocheters and sometimes just watching for a few minutes can set you on your way; especially if you’re having problems visualising what to do, don’t know where to go into a stitch or are just feeling a little fed up of instructions written for a right hander. 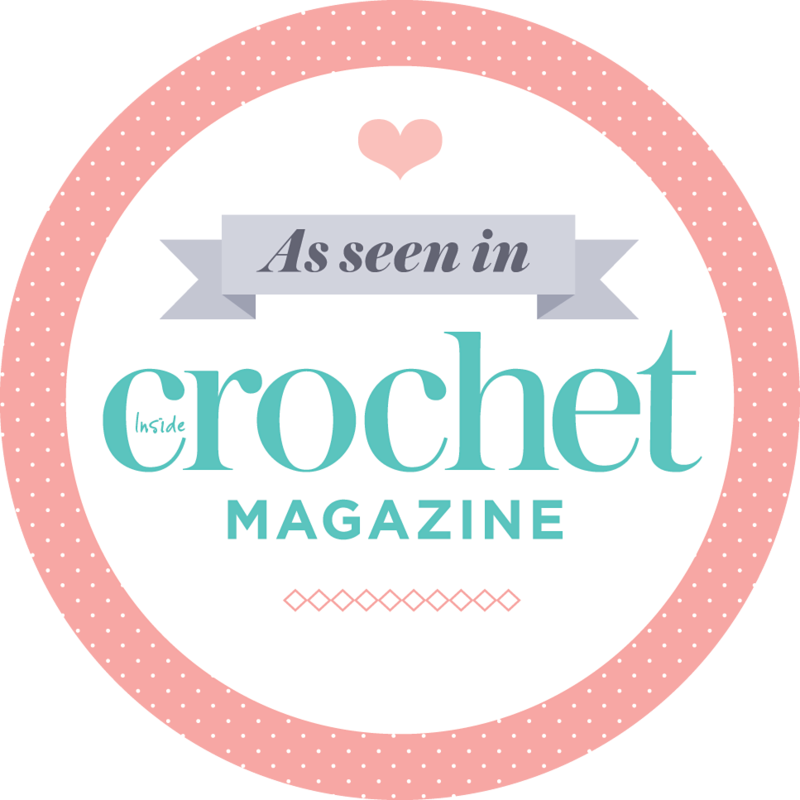 Simply Crochet magazine has a how-to section at the back every issue which includes a photo tutorial for some stitches for left and right handers. 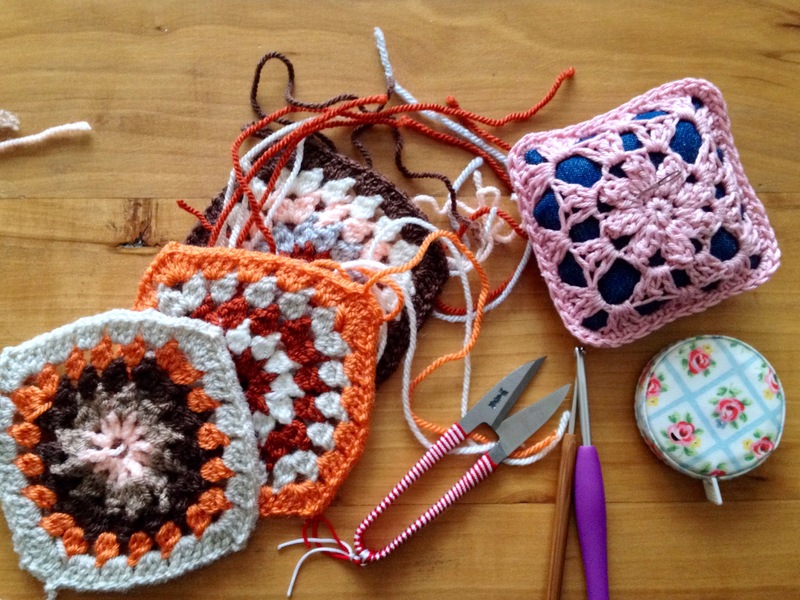 This approach seems to be pretty rare compared to most crochet and craft magazines. 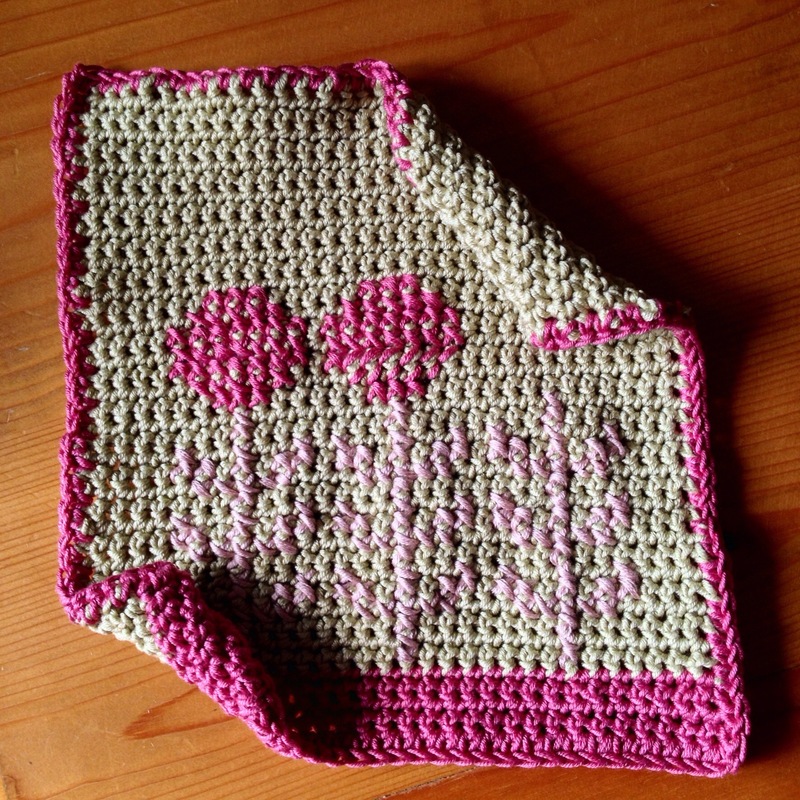 There are several Ravelry groups for left-handed crocheters, where I’m sure you would be welcome to ask questions and seek advice. 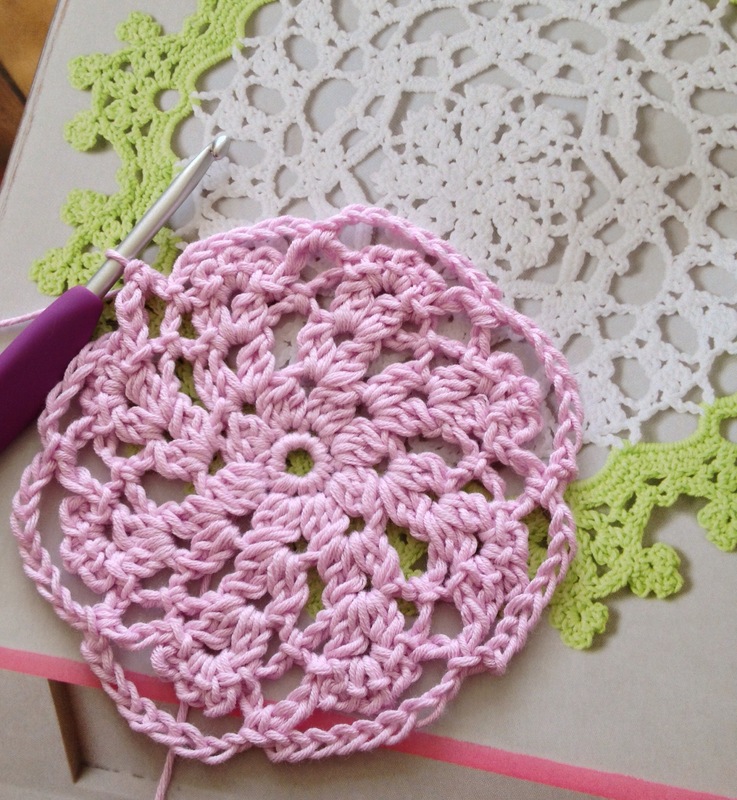 Although I do use left-handed scissors when cutting lots of paper or fabric, I haven’t found that I’ve needed any different tools for crochet. 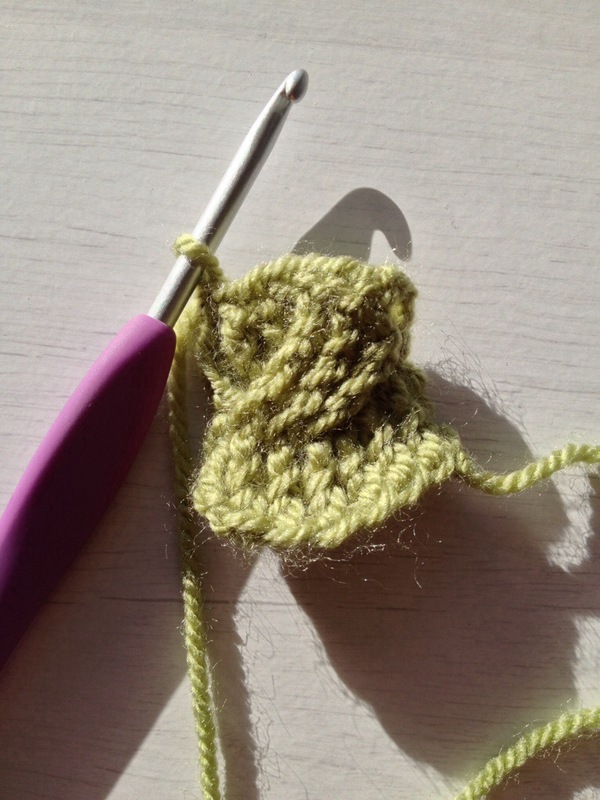 If you do know of something crochet related for lefties I’d love to know about it, please. If you’re left handed you’ll be crocheting rows from left to right. When you begin your first row (called the foundation row) you’ll be working along the chains from the left to the right. When a pattern tells you that the foundation row is the right side of the work remember that’s the side where the cut tail of the yarn will be hanging down on the right hand-side. If the foundation row is the wrong side of the work the cut tail of yarn should be on the left. Just so that I remember I usually don’t darn this in until the end as it reminds me which side I need to darn into and which to leave. 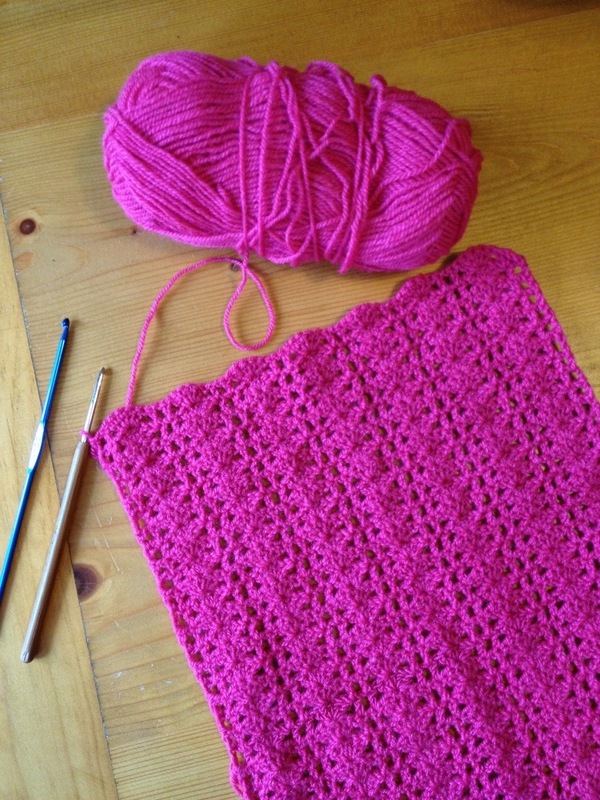 As a leftie you’ll be crocheting around to the right, or clockwise. This is worth remembering when you are more experienced and start using symbol patterns. These types of patterns show the stitches going to the left for right handers, but you will be doing the same stitches in the same order but going around to the right. Are you beginning to see why the moral support of YouTube videos, books and tutorials for lefties can be so encouraging at times? It’s just a case of remembering that the pattern will be written assuming that you’re right-handed 99% of the time. Most of the time this doesn’t matter at all, but just pause and think about the instructions before you begin. 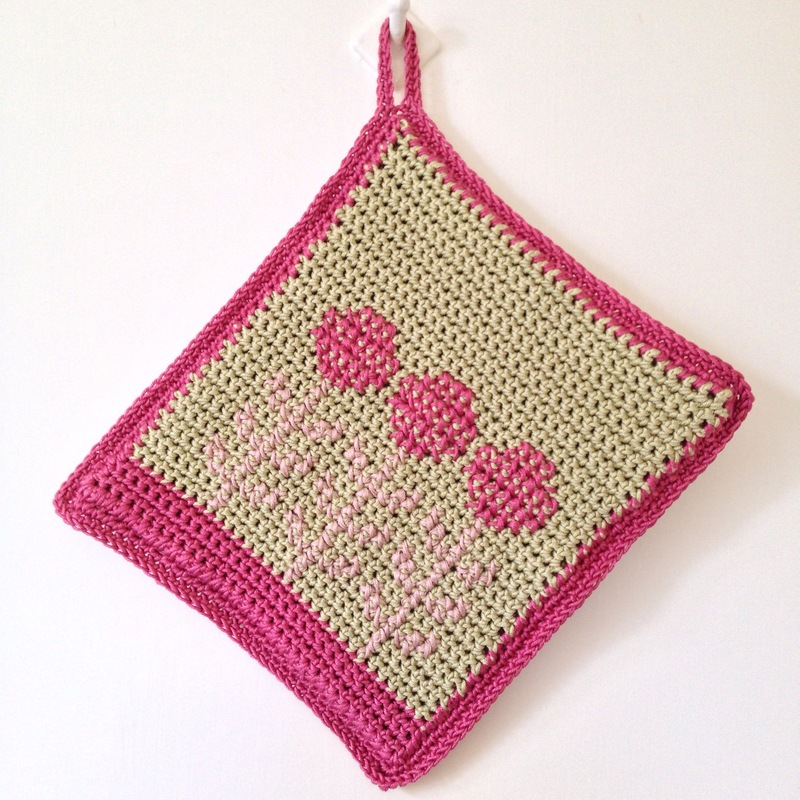 For example: if you’re going to try some colourwork you might need to reverse the instructions, unless the design is symmetrical. So, if you’re told to follow the chart with odd numbered rows going from right to left, just remember that your rows are going to be from the left to the right.